Detoxifying Face Mask: Ring in the New Year with a Fresh Face! The new year is upon us and it has me looking at all of the ways I need to detox in my life. After a holiday season of sugary treats and candy, my face is telling me that it needs to detox from all of the holiday cheer I forced upon it. What better than a detoxifying clay face mask to freshen our faces as we ring in the new year? Your skin is, by a long shot, the largest organ your body proudly carries. This is why many ailments are reflected in the health of our skin, giving the outsider a glimpse into your personal health. Water is the most important ingredient that you can have on hand during a detox, especially for your skin. Drinking the requisite amount of water for your weight, daily, can literally shed years off of your face and skin. While trying to detoxify, it is important to drink water often, to help flush all of the toxins out of your body. I will be challenging myself to hydrate daily during January, and will be blogging (and photographing) about my results. Please feel free to join me in my challenge and watch your skin glow from hydration! There are plenty of herbs I could have chosen to add to this mask because of their drawing abilities, but the activated charcoal and bentonite clay do a great job of that by themselves. I like to add antioxidants such as vitamin C to my recipes because I feel it completes the process by putting the life back into your skin after drawing out impurities. The addition of camu camu powder could also be beneficial due its high vitamin C content! Activated charcoal – Known to absorb 100-200 times its weight in impurities, activated charcoal is the perfect ingredient to help purify and deep clean the skin. You’ll want something like this. Bentonite clay – A unique clay, it produces an “electrical charge” when wet, giving it the ability to absorb toxins and neutralize heavy metals. These special powers and its gentle nature is why bentonite clay is often used both internally and externally for detoxifying purposes. We used this bentonite clay. Green tea – Rich in antioxidants, green tea is great at flushing toxins from the skin. The catechin compounds in green tea have been known to reactivate skin cells that are dying due to poor lifestyle habits, exposure to sunlight, and even pollution. Hibiscus – Known to some as the “botox plant”, hibiscus is rich in alpha hydroxy acids (vitamin C). These acids can gently exfoliate your skin while also encouraging the replacement of dead and dull skin cells with new ones. Hibiscus also has anti-aging properties capable of soothing, smoothing, and firming the skin. You can get it here. Rosehips – Naturally rich in vitamin C, rosehips are a great antioxidant, help clear congested skin, smooth fine lines and wrinkles, and reduce inflammation and redness. This gentle herb can awaken and revitalize skin, helping to reduce aging and scars (read more about this floral superfood). The secret to this mask is to lightly spray your face with a toner or some other liquid whenever your face starts to feel itchy, drying, and tight as the mask dries. Preventing the clay mask from fully drying helps to keep your face from getting red and irritated. This also helps your face stay hydrated, since letting clay masks dry to cracking can cause dryness for some skin types. In a glass or wooden bowl and using non-metal utensils (so as not to deactivate the negative charge in the bentonite clay), combine all of the powders together until thoroughly mixed. Store in a glass or plastic jar in a cool dark location when not in use. Combine 1-2 teaspoons of the powdered mud mask with 2-4 teaspoons of water or hydrosol. (For an extra treat, you can use herbal tea, honey, yogurt, milk, or even fresh squeezed juice instead of water.) Allow mud to sit for 5 minutes and then apply to your face. Allow mask to stay on face 15-20 minutes, spraying your face gently with water, toner, or hydrosol whenever the mask starts to feel itchy, dry, or tight. Rinse your face clean using a washcloth, gently exfoliating your skin in the process. After rinsing clean, always follow with a toner and moisturizer to close your pores and lock in moisture. Interested in taking your DIY projects to the next level? 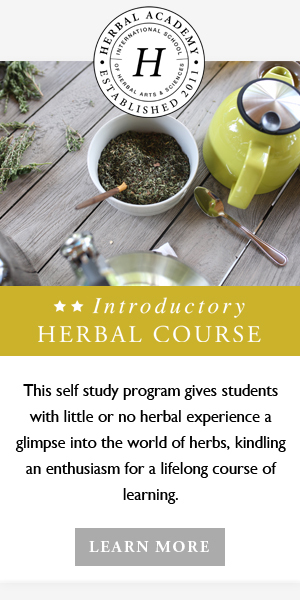 Begin with the Online Introductory Herbal Course which will teach you all the herbal basics, and sign up for membership in The Herbarium, your virtual and vibrant collection of herbal resources.